Scholastica makes it easy to set the manuscript submission fee for authors, and makes it easy to automatically transfer revenue from submission fees directly to the journal's bank account via Stripe Connect. Submission fees are a great way for Open Access journals to financially support their work by spreading the cost across all submitted manuscripts. Note that this feature is not available for law reviews. Before collecting an additional submission fee for your journal, you'll need to sign up for Stripe Connect. Scholastica uses Stripe to process credit card transactions and Stripe Connect to transfer your journal's portion of the submission fee to your bank account. Under "How would you like to pay for this journal? ", the journal must be set to the "Author Pays" model (it wouldn't make much sense for the journal to charge itself more money for each submission!). Click Setup Additional Submission Fee and then click Connect with Stripe. You'll be taken to Stripe's website. Enter your business details and click Authorize access to this account. You'll be taken back to Scholastica and will see a message saying, "Your Stripe Connect account has been successfully activated." You can now move the slider to adjust your additional submission fee. You will see a slider to set the total author fee. The minimum is $10 (which is Scholastica's base submission fee), and the maximum is $100. 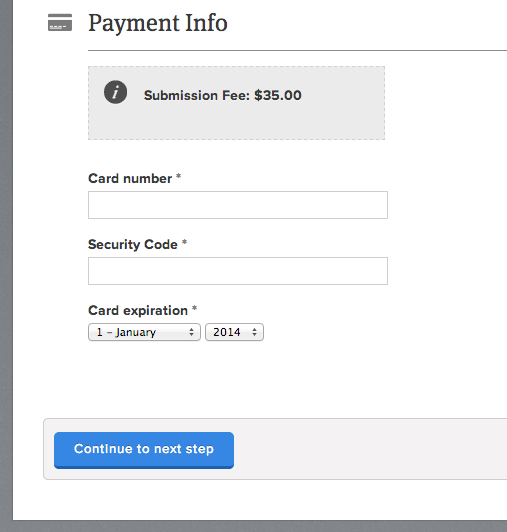 Click and drag the slider to set the total submission fee. Click Update Billing Info to save the changes. Here is a detailed explanation of how submission fees are calculated and distributed. Scholastica charges $10 for every (non-law journal) submission. Journals have the option of paying this fee in order to make submissions free to authors or of having the authors pay the fee. Journals can charge an additional fee beyond Scholastica's $10 base fee. This additional fee is paid to the journal, minus Stripe's processing charge for the transaction. Stripe charges 2.9% + $0.30 per transaction. 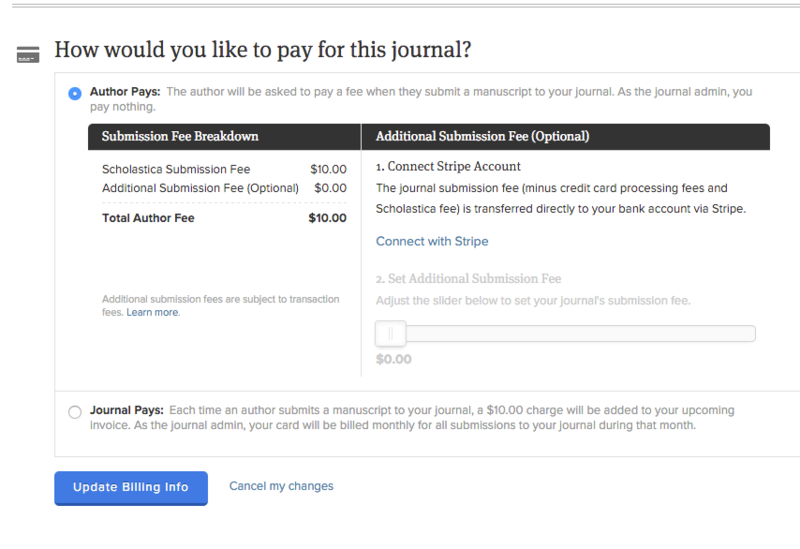 Journals are only responsible for Stripe's processing charge if they are charging an additional submission fee beyond Scholastica's $10 base fee. None of the fee breakdown is visible to the author. They simply see one price: the total submission fee. When the author is submitting, they simply see a credit card form on the submission page asking them to pay the full submission fee price. Authors will see a single charge on their credit card with the name of your business name listed as the source. This is determined when you sign up for Stripe Connect.